Americans certainly take sports seriously, and no sport is as important to Americans than football. The Rose Bowl on New Year's Day and the Super Bowl every winter are national cultural events, the latter is the largest watch television event each year. Even tonight, the American President has moved up a speech before a joint session of Congress in order not to conflict with the kick-off of the first game of the National Football League 2011 season. It's no wonder that we sometimes question if we have our priorities in order. Which is why it is refreshing that the festivities in Lowell, MI this weekend are getting so much attention. 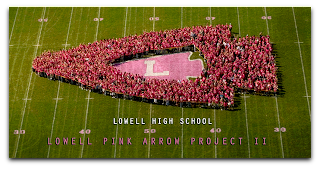 I wrote about the "Pink Arrow Pride" last fall and how it was featured nationally by High School Football America (and back on their home page), for how it has unified a community and raised over $700,000 in three years to support local families battling cancer. The event continues to grow and garner national attention as a film crew from NBC's "Today Show" will be there tomorrow capturing all of the festivities and interviewing coaches, players, and volunteers for a segment to air next week. It is indeed a community sensation. Pink banners and t-shirts have lined the town lamp posts for weeks and almost 6,000 official Pink Arrow Pride t-shirts have been sold. Many of those t-shirts, like the pink jerseys the football team will wear tomorrow night, feature the name of a friend or relative on the back who is or has battled cancer. As I mentioned in my post last year, this event hits more closer to home for me because Lowell, MI is home. 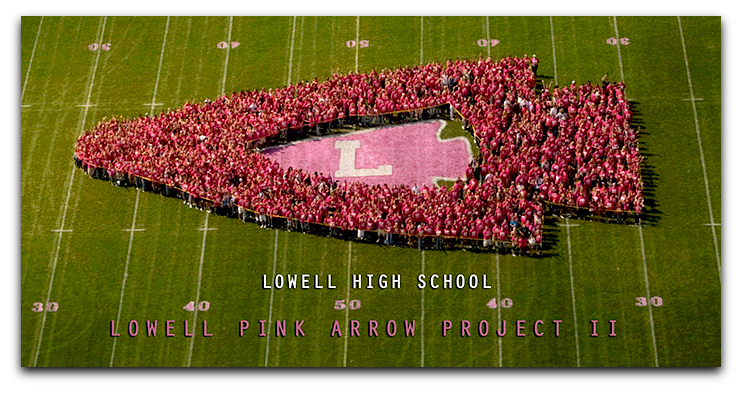 I look forward to finally being able to attend a Pink Arrow game at my high school alma mater and join in the sea of pink in the bleachers as a crowd approaching 10,000 is expected. I hope to go over early and watch the soccer game and volleyball match scheduled to take place on the football field prior to the football game. I'll plan to post pictures this weekend or early next weekend of the festivities and hopefully the NBC crew. I'll also do my best to alert you to when the segment will air on the Today Show and do my best to re-post it here on our site, so be sure to check in on the site or with us on Facebook or Twitter (@MichiganExpats) for more.